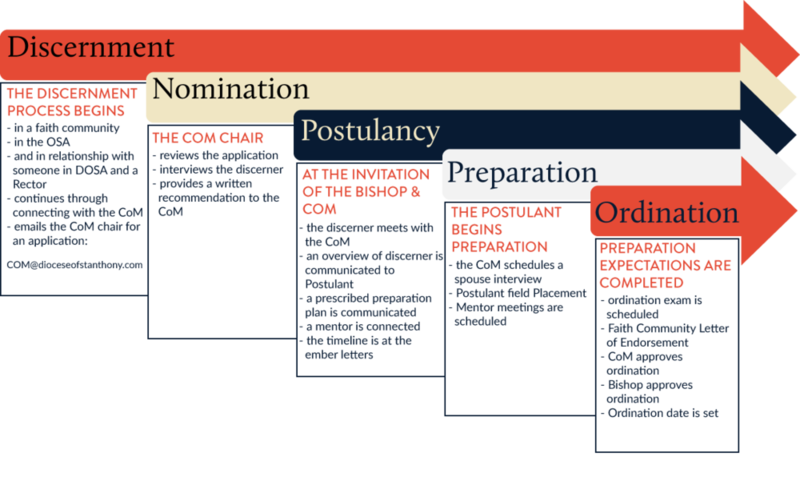 Holy Orders describes the historic three-fold order of ordained ministries in the Church. Ordination is the rite in which God gives authority and the grace of the Holy Spirit to those who are being made bishops, priests, and deacons through prayer and the laying on of hands by a bishop. Each of the three-fold orders carry with it a unique ministry to serve God's people, the Church, and the community. When one is called to be ordained they enter a process of discernment. This is a time of prayer, reflection, dialogue, and study to discover the direction to which one is feeling called by God. It is a formational journey done in community, under the oversight of the Bishop and the Commission on Ministry in the Diocese of St. Anthony. This journey doesn't always result in an invitation to Holy Orders. It continues after a verbal/written recommendation from someone in DOSA to the CoM chair. The Aspirant will reach out to the CoM chair via com@dioceseofstanthony.com and after a short conversation the CoM will email them a robust application. The CoM chair reviews the application, schedules and interviews the discerner, and provides a written recommendation to the Bishop and CoM. The CoM meets to pray, discuss and discern the Aspirants Preparation Plan that will get them ready for Ordination. At an official invitation of the Bishop and the CoM the individual is scheduled to meet with the CoM to discuss the Preparation Plan. After being officially received into the process by the Bishop, the Aspirant meets with the CoM. An overview of Preparation Plan is communicated to the Aspirant. After prayer and discussion a decision is made to move forward. If the Bishop, Aspirant and CoM agree to move forward together the Aspirant is prayed over, provided the Preparation Plan and announced publicaly as a Postulant. A timeline with benchmarks is set. The postulant is given an ember letter schedule. The postulant is announced to DOSA and/or to the local church. An ordination exam is scheduled. Faith Community letter of endorsement.